These authors, whose work called down to me over the centuries, taught that the work of my hands mattered to God. They wrote that our work serves three great ends: it glorifies God, it serves the common good, and it furthers the Kingdom of God. That includes everything we do from the most significant project to the most mundane task. This book has been written as a simple Biblical primer on integrating our faith and our work. Even for many Christians, work is often only a means to an end. Many Christians today have bought into the pagan notion that leisure is good and work is bad. They have also been misled by the sacred/secular distinction, which teaches that working in the church is the only “real” fulltime Christian service. We must learn not just to work to live, but to live to work for the glory of God. Few, however, understand that even in our everyday work, the Scripture teaches no separation between the secular and the sacred. No church-related work or mission is more spiritual than any other profession such as law, business, education, journalism, or politics. In nothing has the Church so lost Her hold on reality as in Her failure to understand and respect the secular vocation. How can anyone remain interested in a religion that seems to have no concern with nine tenths of his life? The Church’s approach to an intelligent carpenter is usually confined to exhorting him not to be drunk and disorderly on Sundays. What the Church should be telling him is this: that the very first demand that his religion makes upon him is that he should make good tables. The purpose of this book is to explore the Biblical intersection of faith and work, attempting to understand the differences between work, calling, and vocation and how they should be Biblically applied in our daily lives. Guinness differentiates between our primary and our secondary callings: “Our primary calling as followers of Christ is by Him, to Him, and for Him… . Our secondary calling, considering who God is as sovereign, is that everyone, everywhere, and in everything should think, speak, live, and act entirely for Him.” Our primary calling should lead without fail to a number of secondary callings. We discern the difference between our primary calling “to be” and our secondary callings “to do” when we fully integrate God’s call into all areas of life. For followers of Christ, these secondary callings should lead us to find our unique life purpose, in order to use our particular gifts and abilities to their utmost for God’s glory. In this book we will examine four areas related to the Biblical doctrine of work. First, it will examine the Biblical understanding of work as outlined in the Old and New Testaments. Second, it will look at the history of the doctrine of work as experienced by the church during the last 2000 years in an attempt to understand how the church has wandered so far from the Biblical truth about work. Third, the book will define the Biblical principle of all work as calling and how we are to live our lives in the light of that truth. Finally, this book will look to the future and offer some direction for rediscovering this lost Biblical doctrine of work and understanding how, if properly understood, our vocational calling can help Christians impact our communities, our cities, and our world by helping restore the culture to the glory of God. Next week we’ll look at chapter 2 of the book. Won’t you read along with us? Chapter 2 The Gospel, The Kingdom and Our Calling: What Does the Bible Say About Work? God is a worker. From the very beginning of the Scriptures we are faced with the inescapable fact that work is part of God’s character and nature. Work in different forms is mentioned over 800 times in the Bible, more than all the terms used for worship, music, praise, and singing combined. Christians do not fully comprehend the Biblical concepts of work, calling, and vocation because we have lost the vision of the grand metanarrative told by the Bible. This metanarrative encompasses Creation, Fall, Redemption, and Restoration. It is sometimes called the Four-Chapter Gospel. We have so dissected and compartmentalized the Bible that we have lost sight of its great overarching story. The Biblical metanarrative makes a comprehensive claim on all humanity, calling each one of us to find our place in His Story. In the Two-Chapter Gospel, Chapter One presents our problem: separation from God because of our sin. Chapter Two presents the solution: Jesus Christ has come into the world to bring salvation and reunite us with God through His work on the cross. While sin and salvation are undeniable realities, they are not the complete gospel. In this abridged version of the gospel, Christianity becomes all about us. The Two-Chapter Gospel ignores creation and the final restoration. It leaves out God’s reason for our creation (which we will consider later as the Cultural Mandate) and the Christian’s final destination. Our mission goes beyond evangelizing far-off places or teaching a Sunday School class. It defines the meaning of our entire lives, which necessarily means that it encompasses our vocational work. The opening two chapters of Genesis provide a foundation for how God sees work, culture, and man’s responsibility. Work is not a curse but a gift from God. By our work we employ useful skills to glorify God and love our neighbors. Work is not a result of the Fall, although the Fall because of its curse made it inevitable that sometimes work would be frustrating and feel meaningless (Genesis 3:17-19). In the opening chapter of Genesis we find what is called the Cultural Mandate, also known as the Creation Mandate. “God blessed them and said to them, ‘Be fruitful and increase in number; fill the earth and subdue it. Rule over the fish of the sea and the birds of the air and over every living creature that moves on the ground’” (Genesis 1:28). Traditionally Christian theologians have understood Genesis 1:28 as mankind’s purpose and permission for engaging the world. Being in the image of God refers not only to who we are but also to what we are created to do. We are called not just to work but to do certain tasks to achieve a definite goal. Genesis 1:28 commands us to be fruitful, increase, fill, subdue, and rule. These five commands reveal our most basic human responsibilities. Richard description of how the Cultural Mandate works: The Great King has summoned each of us into his throne room. Take this portion of my kingdom, he says, I am making you my steward over your office, your workbench, your kitchen stove. Put your heart into mastering this part of my world. Get it in order; unearth its treasures; do all you can with it. Then everyone will see what a glorious King I am. That’s why we get up every morning and go to work. We don’t labor simply to survive, insects do that. Our work is an honor, a privileged commission from our great King. God has given each of us a portion of his kingdom to explore and to develop to its fullness. A strong argument can be made that Jesus’ Great Commission (Matthew 28:18-20) is a restatement of the Cultural Mandate for His church. Theologians debate how the Cultural Mandate and the Great Commission fit together, but it is clear that both call for a renewal of culture.30 These two great mandates should both hold sway over the Christian’s life. To state it a little differently, the Cultural Mandate which God gave to the first Adam and his bride has now become the Great Commission, which God has given to Christ (Isaiah 42:1-12; 49:1-26) and through Christ to the church (Matthew 28:18-20; Luke 24:45-49; Acts 1:8; 13:47; Romans 15:18). The significance of our work is directly related to its connection with God’s work. When you answer God’s call to use your gifts in work, whether by making clothes, practicing law, tilling the field, mending broken bodies, or nurturing children, you are participating in God’s work. God does not only send ministers to give the world sermons; He sends doctors to give medicine, teachers to impart wisdom and so on. Understanding the importance of the Cultural Mandate in our lives today is the first step in rediscovering the Biblical doctrine of work. Understanding our place in God’s Kingdom is critical to understanding our vocational calling. The word kingdom occurs 162 times in the New Testament. Clearly the Kingdom of God is central to the story of the Gospels. In fact we could make a strong argument that the Kingdom of God is central to the message of all the Scriptures. The Kingdom of God is the fulfillment of the long-awaited Messianic rule predicted in the Old Testament (Psalm 2), although it has come in an unexpected way. The coming of the Kingdom of God involves two great moments. The first is a fulfillment within history with Christ’s birth, life, death and resurrection; the second is the consummation of the Kingdom at the end of history with the second coming of Christ. Many passages in the New Testament lead us to believe that the Kingdom is here already. A large part of Christ’s ministry was the announcement of the coming of the Kingdom of God (Matthew 4:17, 23; 10:7; 24:14; Luke 4:43). At the same time, other New Testament references lead us to believe that the Kingdom is not yet. We can reconcile the apparent contradiction by acknowledging that Christians today live in the tension of the already, not yet. The Kingdom of God has already been established here on earth through the life, death, and resurrection of Jesus Christ; but it has not yet been consummated. The consummation will happen at the end of this present age when Jesus Christ physically returns to bring both peace and judgment and to usher in the New Heaven and New Earth. Despite all the New Testament references to the Kingdom, most evangelical Christians today have no idea that their daily work has anything to do with the Kingdom of God. As Kingdom people, we must be actively spreading God’s reign into every segment of society. We should be influencing the world by bringing God’s love and grace to all, whether through the arts, through business, through politics or through our other vocations. Biblically there is precedent for believers cooperating with non-believers to achieve ends under the Cultural Mandate. Joseph worked with the Egyptians to alleviate famine (Genesis 41). Daniel served faithfully in Nebuchadnezzar’s court (Daniel 2). The Scriptures talk about God’s grace in two fundamentally different ways. The first is what theologians call special grace. It is the favor of God which actually results in salvation. Common grace is common because it is universal; it is grace because it is undeserved and given by a gracious God. First, through common grace God restrains sin. Second, through common grace God restrains His wrath against sinful mankind. Common grace even restrains evil by placing restraints on the consequences of sin. For example, even though the ground is cursed due to the sin of Adam, it still brings forth enough to sustain mankind. Third, through common grace God bestows His blessings, both physical and spiritual, on all of mankind, including those who will reject Christ. The first purpose of common grace is to redeem those who will be saved. The second purpose of common grace is to demonstrate God’s mercy and goodness, which are seen not only in the gift of salvation to believers but also in the blessing He gives to all people. The fact that God delays judgment is another example of his mercy. By delaying punishment, God shows that He finds no pleasure in executing His final judgment, but rather delights in the salvation of men and women. The third purpose of common grace is to demonstrate God’s justice. Finally, the fourth purpose of common grace is to demonstrate God’s glory in the many ways His common grace actively operates in the lives of all human beings. Even though their motives are sinful, unbelievers still reflect the excellence of their Creator and bring glory to God in an imperfect but significant way. God also uses common grace to work out His redemptive plan for His creation. Common grace is one of the means by which Christians serve the common good of their neighbors and transform the culture. It allows us to work alongside non-Christians for a common purpose. We often meet people who are not Christians but who agree with a Christian stance on a certain cultural issue, and therefore they are willing to work together with Christians toward resolution. We should be open to working with them for a common goal. The Christian employee, surrounded by non-Christians at work, can take great hope from the doctrine of common grace. This doctrine helps us make a strong Biblical case for engaging the culture while embracing the gospel. Wherever we work, we can rest assured that God can use us through our vocational calling to influence our fellow employees, our company, our city, our nation, and the world for the glory of God. Success, defined as being the master of your own destiny, has become an idol of our culture. Tim Keller, describes the idol in these words: More than other idols, personal success and achievement lead to a sense that we ourselves are God, that our security and value rest in our own wisdom, strength and performance. To be the very best at what you do, to be at the top of the heap, means no one is like you. You are supreme. The New Testament defines success in a similar way in a story which Jesus told, known as the Parable of the Talents (Matthew 25:14-30). This parable offers profound Biblical insight not only into the definition of success, but into purpose of our call to work. The Parable of the Talents describes what our work should look like while we wait for the return of Christ and the final consummation of His Kingdom. Calvin made it clear that the use of our talents is not restricted to the church or to pious duties. It encompasses the whole of creation. Therefore Calvin’s doctrine of callings emphasizes the utility, activity, and purposeful nature of God’s work in the world. John Piper explains: Calvin’s doctrine of “vocation” follows from the fact that every person, great and small, lives “in the Divine Presence.” God’s sovereign purposes govern the simplest occupation. He attends to everyone’s work. This yielded the Protestant work ethic. Huge benefits flow from a cultural shift in which all work is done earnestly and honestly with an eye to God. Taking nothing away from Calvin, we should be careful not to read our current meaning of the word talent back into the parable. The Parable of the Talents teaches us that God gives us everything we need in order to do what He has asked us to do. The master expects His servants to do more than passively preserve what has been entrusted to us. He expects us to generate a return by using our talents toward productive ends. Calvin and the Reformers also taught that our talents are given not merely for our personal joy but for the common good. We know that we work in a fallen world. Because of the curse of sin, our work will be difficult, and we will not feel God’s pleasure all the time or at the level we will enjoy in the world to come. But we should feel satisfaction and joy from doing our best with what God has given us in the place where His providence puts us. Next week we’ll look at chapter 3. Won’t you read along with us? Why does today’s church have such a distorted view of work? Prior to the Christian era we find two sharply contrasting views of everyday work among the Greeks and the Jews.During New Testament times, Roman and Greek attitudes about work were shaped by Aristotle, who taught that it was demoralizing and demeaning to work with your hands or to work for pay. Aristotle said that to be unemployed was good fortune, because it allowed a person to participate in the life of contemplation. He argued that the contemplative life is the happiest life. Greek society was organized so that a few could enjoy the blessings of leisure while work was done by those in lower social-economic positions and slaves. The Old Testament placed a high value on work, even menial labor. Work was part of God’s purposes in creation.It is significant to note that Jewish teachers, unlike their Greek counterparts, were not expected to live off the contributions of their students, but were expected to have a trade to support themselves. In light of the Old Testament background, it is not surprising to see the same appreciation of work in the first-century Christian church. Though He called his disciples out of their vocations, Jesus gave no general call for all Christians to give up every day work. Paul also emphasized a positive view of work when he commanded all Christians to continue in their work and to work well (Colossians 3:23-24; 1 Thessalonians 4:11-12). By the beginning of the third century we begin to see a subtle shift in the way Christians understood vocation.By the end of the third century, with the end of persecution, the separation between Jerusalem and Athens began to disappear. The Church Fathers began to be more heavily influenced by Greek thought. In their theology, the positive view of all work as God’s work began to change to the Greek view that work is demeaning. We can see this influence in the writings of Eusebius and Augustine. Eusebius of Caesarea writes of two contrasting ways to live. There is the “perfect life,” the vita contemplativa, consisting of sacred vocations dedicated to contemplation; this life is reserved for priests, monks, nuns, and those in similar religious orders. Then there is the “permitted life,” the vita activa, which encompasses secular vocations dedicated to action, such as governing, farming, trading, soldiering, and homemaking. In a similar way, Augustine distinguished between the active life and the contemplative life. While both kinds of life were good—Augustine had praise for the work of farmers, craftsmen, and merchants—the contemplative life was of a higher order. The church not only embraced Augustine’s view but expanded it to the point that it dominated Christian thinking until the Reformation. The duality between the spiritual and secular was being established. Pursuing the contemplative life or a professional role in the church would soon be the only truly religious vocation. In the medieval church, having a vocation or calling referred exclusively to full-time church work. If a person felt a calling, this was a sign that he or she might “have a vocation,” which meant becoming a priest, a monk, or a nun. Theordinary occupations of life—being a peasant farmer or kitchen maid, making tools or clothing, being a soldier or even king—were acknowledged as necessary but worldly. It was initially through Martin Luther’s efforts that the 16th century Reformers began to recover the Biblical doctrine of work. They began to recognize that all of life, including daily work, can be understood as a calling from God. In The Fabric of This World, Lee Hardy summarizes Luther’s position on vocation: “Vocation is the specific call to love one’s neighbor.” According to Luther, we respond to the call to love our neighbor by fulfilling the duties associated with our everyday work. This work includes domestic and civic duties as well as our employment. In fact, Luther said we can only truly serve God in the midst of everyday circumstances, and all attempts to elevate the significance of the contemplative life are false. Calvin taught that every believer has a vocational calling to serve God in the world inevery sphere of human existence, lending a new dignity and meaning to ordinary work. Calvin’s view of vocation is less static than Luther’s, encouraging a greater degree of self-consciousness to examine possibilities and the potential to change occupations. At the time such a change was a revolutionary idea. The Reformed view of work and calling was further developed by the Puritans, who also encouraged enterprise and thrift. They maintained a strong ethic which emphasized stewardship and service. Kant’s ideas opened the way for a radical change in society’s prevailing view of work. During this same time period, two additional forces emerged which would have lasting influence on the theology of work in the Western world: the industrial revolution and Marxism. Regardless of the origin of the idea, the concept of vocation became so closely associatedwith a person’s career that the words became synonymous, and all connection with the calling of God disappeared. The views of vocation held by the Reformers and Puritans failed to address the rapid changes brought on by industrialization. While Marxism and capitalism are regarded as opposites, both see the pursuit of a vocation as an end in itself. Both encourage workers to look for personal fulfillment through the labor of their own hands. Where once the medieval church threatened to divorce faith from work, now work has become an idol to which we look for our identity. Neither capitalism nor Marxism can deliver on the promise to bring significant meaning to our work. That is why so few people, including Christians, find genuine satisfaction in their jobs. As a result of these sociological changes and the theological shift brought about by the Second Great Awakening, by the end of the 19th century the Biblical doctrine of work was all but lost to the church. Today the church needs to embrace the truth of the Biblical doctrine of work. It is one of the most important gifts God has given us to influence the world and to find deep satisfaction in our lives here and now. Next week we’ll look at chapter 4. • The integration of faith and work is misunderstood not only by the church members who sit in the pews but by those who stand behind the pulpit. Our vocation should be “an element of Christian discipleship; a habit of the mind and heart of listening for and responding to the voice of the Lord,”144 yet this concept is missing from most churches. • At the beginning of the 21st century we are confronted with a wall between personal faith and public work. The wall has been raised by two distortions of the purpose of our work. Os Guinness calls them the two “grand distortions:” the “Catholic Distortion” which elevates the spiritual at the expense of the secular and the “Protestant Distortion” which elevates the secular at the expense of the sacred. “Did you hear Joe Smith has left his job at the bank to go into fulltime Christian service as a pastor?” That would be an example of the Catholic Distortion, which devalues vocational work in the eyes of God. • In contrast to the Catholic Distortion, the Protestant Distortion of work is a form of dualism. It does not elevate the secular at the expense of the spiritual; rather it severs the secular from the spiritual altogether.146 It turns work, a good thing, into an idol, an ultimate thing. • To avoid both the Protestant Distortion and the Catholic Distortion requires a successful integration of faith and work. Evangelical Christians fall far short in that area. • The calling is something which comes to someone and is particular to someone. • A career is usually associated with a certain occupation. However it is usually not the same as a calling. • The most specific and immediate of the three terms is job. It has to do with current employment and a specific job description. • The doctrine of vocation was developed with its greatest rigor by Luther, Calvin, and the other Reformers. They believed that our first call is to follow Jesus out of darkness into light and out of death into life. This is what Os Guinness call our primary calling. • The Reformers also recognized something else called vocational calling, which is the call to God’s service in one’s work. This is one of what Os Guinness calls our secondary callings. There are additional secondary callings in different realms, such as family, society, and church. • Our obedience to our primary calling to Christ can be seen working itself out in these four secondary callings, which are the call to human family, the call to church, the call to community, and the call to vocation. • One of our secondary callings is to be a part of our human family: brother, sister, son, daughter, father, or mother. • Another secondary calling is to the church. • The third secondary calling which flows from our primary calling was described by the Puritan author William Perkins as “a certain kind of life ordained and imposed on man by God for the common good.” The gospel commands us to serve God’s purposes in the world through civic, social, political, domestic, and ecclesiastical roles. We are to love God and to love our neighbor in the larger community beyond the church by engaging in justice and mercy as God leads us. • Finally the fourth secondary calling which follows from our primary calling is our call to vocational work. We may also term it our vocational calling. • There is no distinction between spiritual and temporal, sacred and secular. All human work, however lowly, is capable of glorifying God. • Throughout this book we will use the term vocational calling in the same way as the Reformers. • Vocational calling in the medieval church applied only to the holy orders of the priests. Not until the Reformation do we see the idea of vocational calling applied to all work. • In order to understand the Biblical doctrine of work, we must clearly understand the differences between vocational calling and career, occupation, or job. Vocational calling is the call to God and to His service in the vocational sphere of life based on giftedness, desires, affirmations, and human need. Vocational calling is usually stable and permanent over a lifetime. • A career should be based on the opportunities for service which are presented to a believer enabling him or her to fulfill their vocational calling. Finding the right occupation at any one time is a matter of God’s specific leadership, guidance, and provision. • Vocational calling stays the same as we move in and out of different jobs and careers. Our vocational calling is directly related to the discovery of our God-given talents. • Yet work is about more than us and God; it unites us within community. • In order to take advantage of our opportunity to further the Kingdom in the here and now through our vocational calling, we must rediscover the Biblical doctrine of work, confident that it is the most powerful tool God has given us to have an impact on this present world. Next week we’ll look at chapter 5. 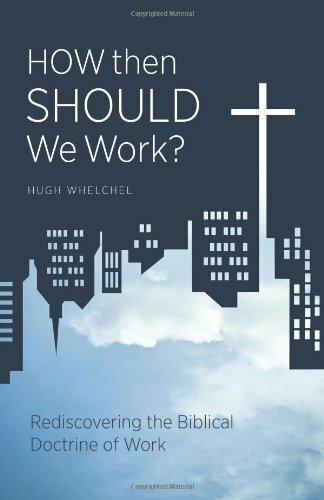 • What are the implications of the Biblical doctrine of work for Christians today? First, we must rediscover that our primary call is to follow Jesus. We must realize that this call encompasses the whole of our lives, including our everyday work. • We must ask questions such as: “If my work is important to God, how should I be conducting my business? How should I be spending my money? How should I live in my neighborhood and municipality? How should I be acting and living in this area of my life?”169 The answers to these questions will help us successfully integrate the life of faith with work. • Second, we must understand the mission that we have been called to do in this world. • For the Christian, life without work is meaningless; but work must never become the meaning of one’s life. We must find our identity in Christ, not in our work. • Finally, we must realize that the purpose of our work is to have an impact on culture with the ultimate goal to redeem culture. • The Biblical doctrine of work is one of the most powerful means God provides for us to shape and influence culture. • Two problems are obvious here. First, only a minority of evangelical Christians hold to a truly Biblical worldview. Second, those who do are not making much of an impact. • A review of current Christian worldview teaching exposes the absence of a vital New Testament concept: the idea of sacrifice. • The intellectual renewal of verse two is important, but the power to live a life that makes a difference comes only from a commitment to deny ourselves and take up our cross daily to follow Jesus (Luke 9:23). • While there is nothing intrinsically wrong with being financially successful, as long as we seek to fulfill our vocational calling, we must be willing to sacrifice what we want for what God wants, laying down our personal choices for what God has chosen for us. • A genuinely Christian worldview is more than an intellectual collection of philosophical and religious beliefs. If it is going to affect the way we live, it must embrace both our minds and our hearts. • Our vocational call flows out of a sacrificially committed life transformed by the power of the gospel of Jesus Christ. • An authentic Biblical worldview does more than avoid the artificial religious/secular division of life; it motivates us to be willing to sacrifice ourselves for the gospel of Jesus Christ. The only appropriate response to the free gift of salvation is obedience to God’s call in every area of life. • We can find no better model for vocational calling in the Old Testament than the story of God’s call on Daniel’s life. • If we take our Christian worldview seriously, we will find ourselves at odds with much of the surrounding culture, just as Daniel found himself. Yet like Daniel we must not withdraw from the world in which we live, but rather engage it in obedience to God’s call on our lives. • Jeremiah’s message to the exiled people of Israel was simple. God meant them to be a blessing to the world even while they lived in Babylon. God intends the same for us. We are called to work for the shalom of the city, whatever or wherever that city is, where God has put us. We are to be a blessing in our time and place. This is possible only because we have found our identity in Christ, the Prince of Shalom. Because of Him we know what real shalom is supposed to be. • The work we do in the here and now is important to God and serves as a signpost to point others to the New City, the City of God, where all of God’s children will live one day in perfect shalom. Until then our calling is to work for the shalom of this present world to the glory of God, by the grace of God reweaving the unraveled fabric of our broken world. • When Christians work to serve the common good of their neighbors, we generate unparalleled influence on the culture. • Tim Keller observes: When many Christians enter a vocational field, either they seal off their faith and go to work like everyone else around them, or they spout Bible verses to their coworkers. We do not know very well how to persuade people of Christianity’s answers by showing them the faith-based, worldview roots of everyone’s work. We do not know how to equip our people to think out the implications of the gospel for art, business, government, journalism, entertainment, and scholarship. • We arrive at two important questions. First, should Christians try to influence culture at all? Second, why have Christian attempts been so ineffective in influencing culture? • In his classic 1951 book Christ and Culture, which is still influential today, H. Richard Niebuhr suggested five potential methods of modeling the interface between Christ and culture. • The first alternative is “Christ Against Culture,” which encourages opposition, total separation, and hostility toward culture and a commitment to creating a separate, pure community (that is, culture) of Christians. Tertullian, Tolstoy, Menno Simons, and in the 20th century, Jacques Ellul are exponents of this position. The Amish, Mennonites, and Anabaptists have their roots in an oppositional stance between Christianity and culture. This group tends to culturally withdraw from the world, either trying their best to ignore it or providing negative criticism from a safe moral distance. • The second alternative is the “Christ of Culture.” It is exactly the opposite of “Christ Against Culture” because it attempts to bring culture and Christianity together, regardless of their differences. Liberation, process, and feminist theologies are recent examples. “Liberal” Protestantism would fit into this category. The third alternative is “Christ Above Culture.” This position attempts “to correlate the fundamental questions of the culture with the answer of Christian revelation.”192 Thomas Aquinas is the most prominent teacher of this viewpoint. It is embraced by both the Roman Catholic and the Eastern Orthodox Churches. • The fourth alternative is “Christ and Culture in Paradox.” In this viewpoint, the Christian belongs “to two realms (the spiritual and temporal) and must live in the tension of fulfilling responsibilities to both.” Martin Luther adopted this view. • The fifth and final alternative is “Christ the Transformer of Culture.” Proponents of this view include the “conversionists” who attempt “to convert the values and goals of secular culture into the service of the kingdom of God.” Augustine, Calvin, John Wesley Note: Jonathan Edwards, John Knox, Ulrich Zwingli, Abraham Kuyper and Francis Schaeffer are the chief proponents of this last view. • Many current evangelical Christians throughout the United States would be found in the “Christ Against Culture” camp. This explains the reluctance of many to engage today’s culture. • The Reformed tradition has historically embraced “Christ the Transformer of Culture.” This perspective embraces the idea that creation is inherently good; therefore human culture is not to be despised but should be celebrated and developed because it is part of God’s intent for the human race. • We are to be actively involved in the transformation of culture without giving culture undue prominence. • The idea of Christ transforming culture takes seriously the overall Biblical narrative of creation, fall, redemption, and restoration. It celebrates the goodness of creation and therefore of human culture. It recognizes the fallenness of creation, but it also recognizes God’s desire to restore creation by the death and resurrection of Christ, through the ministry of the church. • To the first question, “Should Christians try to influence culture at all?” we would answer in the affirmative. • The Bible calls us to engage, redeem, and restore culture; this is at the very heart of the Cultural Mandate. • The Bible itself is responsible for much of the language, literature, and fine arts we enjoy today. Christian artists and composers through the centuries have been heavily influenced by the Bible, and their work reflects its influence. • Nowhere is the cultural influence of Christianity more apparent than in the history of the United States. • We have already seen a number of the historical and theological reasons for American Christians’ cultural retreat, including the two-chapter gospel, the influence of Enlightenment thinking, and the Industrial Revolution. Yet the most overlooked reason for the failure of the church to influence the culture is the loss of the Biblical doctrine of work. • God changes culture through Christians’ faithful participation in our vocational calling. This has been the primary instrument which God has used over the ages to change culture. • The Cultural Mandate calls us to fill the world with the images of God (evangelism) and to take dominion (redeeming culture); it is not either/or but both/and. • Motivated by the Cultural Mandate and inspired by the power of the gospel of Jesus Christ, through our vocational calling we have the opportunity to transform our communities, our nation, and the world. • We can restore the Biblical doctrine of work, Christianity can once again bring its powerful influence to bear on our culture. • Until Christians embrace the Biblical doctrine of work, they will remain ineffective, because they will continue to practice a separation of faith and work which leaves them helpless to impact the culture around them for the glory of God and the furtherance of His Kingdom. The separation of faith and calling by Christians through the loss of the Biblical doctrine of work had a devastating effect on the landscape of American culture during the 20th century. As Christians, we are once again called to Biblically integrate our faith and our work, using our vocational calling to influence our communities, our nation, and the world. Without understanding that Christ died on the cross not only to save us but also to restore all things, Christians get the impression that nothing much about this world matters. Grasping the full implication of the gospel should make Christians interested in both evangelistic conversions as well as service to our neighbor and working for peace and justice in the world. So then how do we integrate our work and our faith in a way that is pleasing to God? First, we must rediscover that our primary vocation is the call to follow Jesus. From our primary call flows our call to the church, to the family, to the community, and to economic work. Our Christian calling finds no separation between the secular and the sacred. To God, what we do on Sunday is no more important or spiritual than what we do on Monday. In all of our work we must labor as though Jesus Himself is the One we must ultimately please (Colossians 3:17). We must call all Christians to rediscover the Cultural Mandate, embracing the opportunity to influence culture to the glory of God and the furtherance of His Kingdom. In the church, we must teach about calling and cultural influence and provide vital support to cultural leaders. Finally, we must see our work within the larger perspective of God’s plan for the restoration of His creation. What is difficult for many of us to see is how of our own vocational work serves God’s Kingdom. All work resulting from our vocational callings has this potential although it is often difficult for us to see specifically what we do day to day as Kingdom work. The work flowing from God’s vocational call on our lives is an extension of God’s work of maintaining and providing for His creation. But even more than that, it is reweaving shalom. It is a contribution to what God wants done in the world. It is bringing the reign of God to bear on all of our spheres of influence. It is pushing back the darkness, it is Kingdom work. All of our work, even the most mundane things we do are taken by God and transformed into Kingdom work.